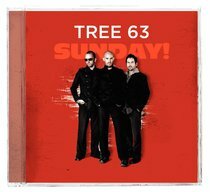 South Africa's very own Tree63 first appeared on the U.S. scene in 2000 with its Dove Award-winning, self-titled debut for Inpop Records. Multiple No. 1 radio hits, domestic and international tours, and four albums later, the trio comprising John Ellis (guitar, vocals), Darryl Swart (drums) and Daniel Ornellas (bass), returns to the studio for its fifth offering, Sunday! Produced by Joe Baldridge (Beck, Jewel, tobyMac, Family Force Five) at Nashville's Garage Rock studios, Sunday! features Tree63's signature contemplative and often confrontational lyrics wrapped in a worshipful sound about the band's love for Jesus and the frustrations that follow being alive in Christ in a world dead with sin.